You are currently browsing the tag archive for the ‘boxing’ tag. In Random Training Notes 16: Heavy Bag Tips, I mentioned the importance of regular feedback from hitting bags etc. in the fighting artist’s training regimen. As important as hitting is, it cane be over done. And without stretching and conditioning, excessive bag work can lead to muscular imbalances that in turn lead to avoidable injuries and performance impairments. 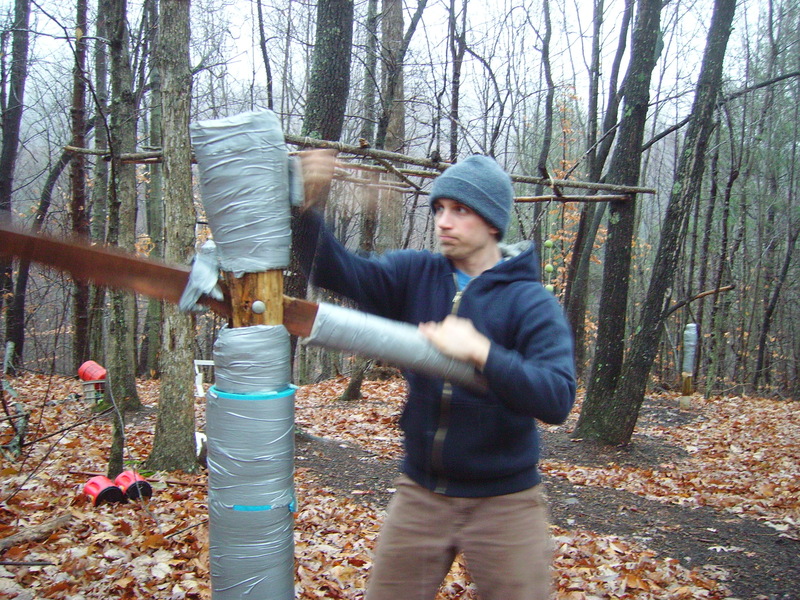 So what should a practitioner of a fighting art or combat sport do to stay balanced? Avoid extensive stretching immediately before engaging in heavy striking work. A light pendulum stretch can activate the rotator cuff muscles and mobilize the superior thoracic outlet and sub-acromial space, which may be tight from training/fighting in a “hunched” posture. 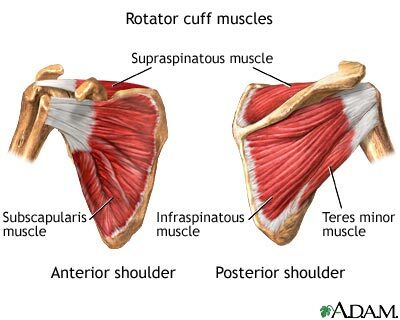 Subscapularis: Shoulder internal rotator. There are also ways of performing this using a stick or towel for assistance, but starting out in the lying position makes it easier to monitor the head of the humerus (upper arm) to ensure that it is not rotating forward. Teres Minor and Infraspinatus. Shoulder external rotators. Notice that she is not forcing her arm down. If the head of the humerus wants to bulge forward and the shoulder up off of the table, don’t push it past this point. Rhomboids: Retract and elevate scapula. 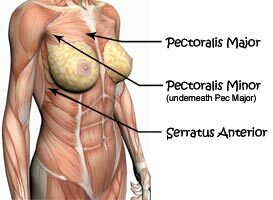 These may lengthened and inhibited from the forward shoulder “hunched” posture common to fighting and training.-Pectorals : Flex, internally rotate and adduct shoulder arm at shoulder, pec minor specifically pulls the scapula forward and down. Do one at a time, avoid the double arm “hanging” doorway stretch. Levator Scapulae: Scapular elevator and medial rotator, neck rotator and lateral flexor. This muscle attaches the cervical vertebrae to the upper medial aspect of the scapula. The upwardly rotated, “hunched” position that many fighters adopt during bag work and fighting can shorten and tighten this muscle. Triceps: Extends forearm. This muscle is heavily used in straight-arm punches and strikes. 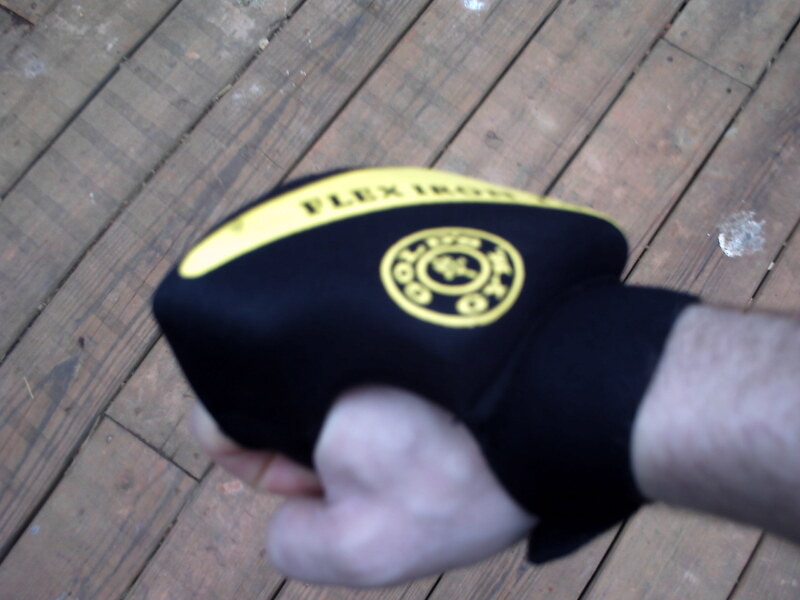 Biceps: Flexes and supinates forearm. 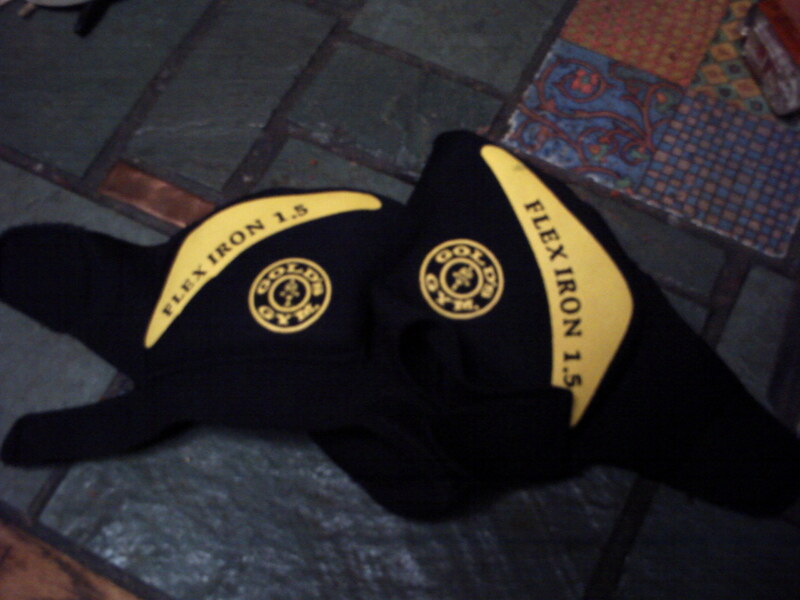 Used heavily in hooks and uppercuts, as well on the return to guard from a strike. 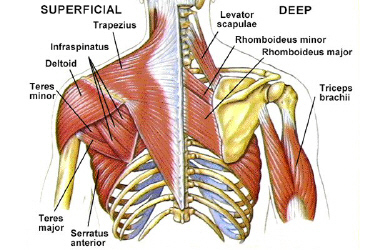 Upper Trapezius: Assist in elevation and retraction of scapulae. This region of the trapezius may be tight from forward shoulder “hunched” posture common to fighting and training. 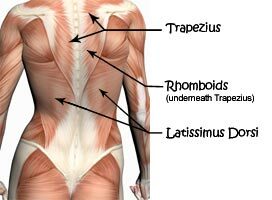 Latissimus: connects the humerus to the thoracic spine, adducts, extends and internally rotates arm at shoulder. These are often tight in people who kick a lot or engage in excessive “air punching.” Hint: if you can’t do a squat with the arms stretched overhead and keep the hands in line with your ears, or can’t help but fold at the waist as opposed to the hips, the lats need serious stretching attention. These are common habits, especially among people who are new to training, bag work or successive sparring. People who train in arts that emphasize a “pullback” motion in tandem with every strike are especially prone to it, and it’s a habit that should be discouraged. I understand the utility of a pullback to create a force-couple with the target, but it is absolutely useless unless something is actually being grasped and pulled back- keep the other hand near your face, where it can serve a purpose (keeping your face from being rearranged). Adopt the habit of keeping your thumbs or palms in contact with your temples. You may not prefer a guard that is quite this high, but the tactile feedback of the thumb contact often works better than repeated verbal coaching about the location of the hands. Once you begin returning naturally to this position, thumb/skin contact with the temples is no longer necessary. Put your bag near a mirror (or a mirror near your bag) so that you can watch what your hands do. Ask a trusted training partner to slap you lightly in the face when your hands drop during a drill. Touching may get the idea across, but a few light slaps will provide quite a bit more motivation to keep your guard up between strikes. Take a resistance cable or band with moderate tension and wrap it across your upper back, in line with the shoulders. Grasp the handles at roughly chin height. As you strike the bag (lightly) the cable will produce higher tension, providing an external motivation to return them to your face as opposed to dropping. Don’t let the tension cause your elbows to flare too wide from the body. The FSRI Virginia club will once again be hosting the annual FSRI Summer Training Camp in Ferrum, Virginia. Camp will run from June 24th-26th (Friday-Sunday). As always, all comers are welcome, regardless of what they practice. Randy Simpson– NASM CPT, Fitness for Fighting Arts Certified Trainer. Simpson’s classes will explore Gentile’s taxonomy of motor skills as a method for planning instruction and analyzing the complexity of fighting skills, and present partner drills to foster development of game skills for close range fighting in a variety of environmental conditions and action goals. This year’s camp will reflect the transition that TKRI has been making away from “traditional” karate and towards a broader approach to the elements of training for fighting skills and self defense. We invite boxers, wrestlers, judoka, MMA students and competitors and other martial artists who have an open mind and the desire to explore methods of pursuing the goals common to all fighting arts. The skill-based training sessions will focus on practical, intuitive responses to violence, rather than historical or theoretical conjecture. Hitting a moving target is one of the most inherently athletic skills that I can think of, and it’s an absolutely vital element in a martial artists’ tool box. I’m a strong advocate of the “hands off” approach of giving a student the conditions in which to explore range and which weapons to apply at different- and changing- ranges. Light moving targets, stationary targets, heavy moving targets and sparring all play an important role. instructions from the coach to impose decisions. Perfect for light, slow shadow boxing or, if it’s your cup of tea, kata (emphasis on light and slow- no need to tear a joint out). I’m a big fan of the Ultimate Fighting Championship. I can’t help myself. I love watching those guys destroy each other. The top fighters exhibit explosive athleticism and devastating technique. There’s a big difference between training to fight in a cage and doing martial arts as a hobby. But, there’s a lot we should have in common, too. The most important thing is mindset. If you learn all the best techniques out there but don’t have the will to fight, nothing else matters. The aggressive attitude of cage fighters often seems ego-driven and arrogant…and it is. But, when the time comes to defend yourself or your loved ones, you will have to “turn off” your conscience. It’s either you, or the other guy, that’s going to get hurt. Make sure it’s the other guy. The importance of physical conditioning cannot be overemphasized. When fighters know all the same techniques, strength, agility, and endurance make the difference. It’s like football. Nobody thinks any other team has better blocking or tackling technique. They just have better athletes. Besides, it should be obvious that we use our bodies to perform every move. The better condition we’re in, the better our karate will be. Many people credit Bruce Lee with initiating the mixed-martial-arts revolution. His Jeet Kune Do was an amalgamation of techniques from different styles organized around the concept of the “stop hit” from Western fencing. Also, he believed in live sparring as the true test of a technique’s effectiveness. But, he was not the first. Mixing martial arts is nothing new. Throughout history, people who actually fought have always wanted to learn anything that would help them survive. For instance, caravan guards of nineteenth-century China often combined Xing Yi’s powerful linear striking methods with the circular throws and evasive footwork of Ba Gua. 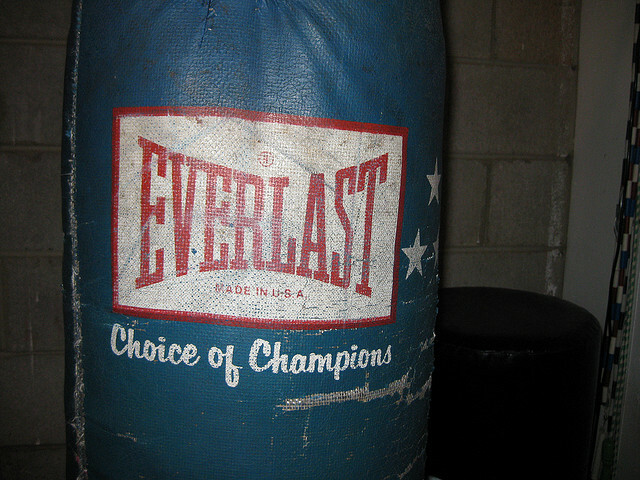 Boxing – Nobody punches better than boxers. That’s all they do. The straight-lead, or jab, is a great way to gauge distance and create a reaction in your opponent. I like the method described in Jack Dempsey’s book, Championship Fighting. According to him, the “stepping straight-jolt” is the most important punch. Muay Thai – The signature technique of Thai boxing is a round kick with the shin. It’s absolutely devastating, but I don’t like it. I could probably do some damage, but my shins aren’t conditioned to handle the impact. However, I can throw knee strikes, while controlling the opponent’s head in the clinch, without hurting myself. That’s good stuff. Freestyle Wrestling – The single and double-leg take downs are simple and effective. Either one is a good way to put an opponent on the ground in a hurry. Plus, the ability to change levels and penetrate quickly are invaluable skills for closing the distance. Greco-Roman Wrestling – Because holds below the waist are illegal, Greco-Roman wrestlers are the best at clinch fighting. 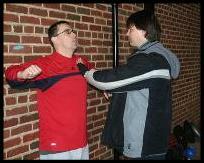 Learning to pummel for under-hook control might be enough to fight off an untrained person. If you can duck under or arm drag to a rear clinch, that’s even better. Judo – In general, I don’t like turning my back to the opponent, and techniques need to be learned without a gi. But, Judo’s basic hip and shoulder throws are hard to beat. Learning to back step well is a good skill to have. Brazilian Jiu Jitsu – The Gracie revolution demonstrated to everyone the importance of grappling methods. Even though the art has it’s roots in the ne waza of Judo, BJJ evolved on it’s own into a subtle and profound art. The most distinguishing characteristic is extensive use of the guard position and an ability to fight on your back. Submissions are not as easy as they look. I’m most concerned with just controlling an opponent and trying to sweep or stand up. The attitude of the Okinawan originators of karate would have been to use whatever worked for them. There was a predisposition to believe that anything Chinese was better, and the Fujien province was most accessible to them. They did the best they could with the knowledge they had. Shouldn’t we do the same? I thought I would post this video. I really like the drill. Have a look.